Today, November 11th, is Pepero Day! It is a commercial holiday here in Korea wherein people give each other a box of Pepero. Why November 11th? Pepero sticks look like 1 and four Pepero sticks would look like the date 11.11. We write dates in Korea in the format yyyy.mm.dd and so 11.11 would mean the date November 11th. This year marks the 30th anniversary of Pepero and they introduced two additional variants: white cookie and hami melon. I planned to post photos of Pepero displays in stores today, but instead I’m posting a photo I saw on Facebook. 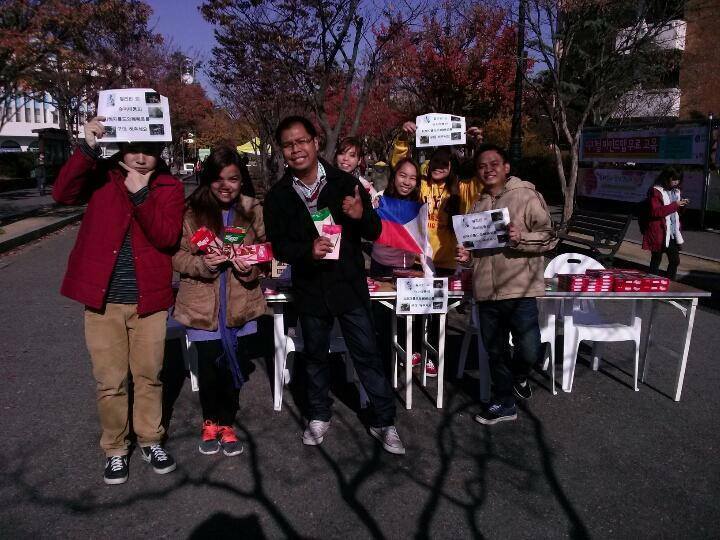 It’s a picture of Filipino students in South Korea’s Chonbuk National University selling Pepero for Typhoon Yolanda victims. Filipino scholars help raise funds for typhoon Yolanda victims. It’s a very meaningful gesture. Though we Filipinos in South Korea are far away from home, we are one with the Filipino people in raising funds to help the victims of typhoon Yolanda be back on their feet. The South Korean government will also be extending help.